While Classical Revolution Cleveland’s mission is pure: to bring the vast world of classical music off of the concert stage and “high art” pedestal and into people’s lives in nontraditional and imaginative ways, we felt unable to remain silent regarding recent policies and a broader conversation about one of our world’s most vulnerable populations: refugees. To that end, we dedicated each of February’s Happy Dog performances to an effective local organization. Our February 7 show at the Euclid Tavern featured the US Committee for Refugees and Immigrants (USCRI) and Rachel Licina, one of their representatives, was on hand to share information and offer opportunities for advocacy. 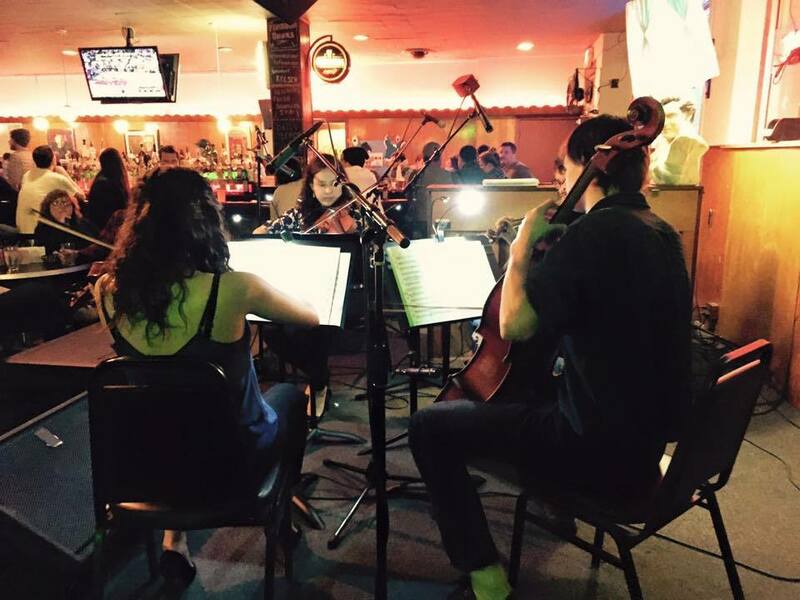 Classical Revolution Cleveland members performed works by Bela Bartok, the Beatles, Bach, and even a Syrian lullaby. Our February 21 show featured The Refugee Response and their executive director Patrick Kearns shed light on what many clients resettled in Cleveland face and how they contribute to our neighborhoods and local economy. Director Ariel Clayton Karas opened the night with a traditional Arabic melody on the violin, and Choral Arts Cleveland joined midway through the evening to offer large-scale choral works, as well as opera favorites. Peppered throughout both shows were freelance artists, CIM students, and area orchestra members and music educators who felt drawn to sharing their music with this unique cause in mind. Indeed, much support was raised (both financially and otherwise) and we were grateful for Sean Watterson and the good folks at both bars for turning their stages into platforms for good. Between the two shows, we raised nearly $2,000 for both organizations and hopefully contributed to increased awareness and opportunities for advocacy. Safe refuge from war and destruction should be for EVERYONE, just like classical music… Those are both values we stand by firmly as artists and members of our community. Next Musician Feature: Carey Skinner!